In the post on simcha, we saw that there is a connection in Hebrew and other Semitic languages between words meaning light and sprouting, between “glow” and “grow” (these two aren’t related in English). I gave a few more examples in that post. However, recently I found a collection of YouTube videos of Avshalom Kor’s language segment on Israeli television, and he mentioned one I hadn’t seen. רָאִיתִי, רָשָׁע עָרִיץ; וּמִתְעָרֶה, כְּאֶזְרָח רַעֲנָן. "I saw a wicked man, powerful, well-rooted like a robust native tree". "I have seen the wicked in great power, and spreading himself like a green tree in its native soil". The verse is unusual because in the other 16 occurrences of the word ezrach in the Tanach, it means "an indigenous, permanent resident of the land", and is particularly used in contrast with ger גר - "the stranger." Only here does it seem to refer to a plant or tree. The translations above, following many of the medieval commentaries, assume that the connection between ezrach as citizen and ezrach as tree is that both are well-rooted in the soil. We see in Latin (and later in English) a similar connection between birth and an ethnic group of people, in the words natal and nation, which share a common root (which also meant "to spring forth, to grow)". So perhaps the best translation for the biblical ezrach would be "native" (unlike citizen, which is related to "city"). Interestingly, Rabbi Aryeh Kaplan, in The Living Torah , translates ezrach as a "person born into the nation", but then notes that it literally means "a native born in the land". The tension between these two meanings is felt more strongly regarding the translation of ger as either "stranger" or "convert". In any case, as Levine points out in his JPS commentary on Vayikra 19:34,"the term ezrah is never applied to the prior inhabitants of Canaan." 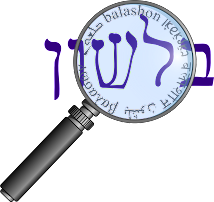 (For further discussion see this interesting Hebrew article by Dr. Eliezer Hadad, or this English abstract). Another derivative of זרח is mizrach מזרח – “east”. We discussed it briefly in this post about the Semitic origins of the word "Asia", but now it is not so clear (to me) whether mizrach means “where the sun rises” or “where the sun begins to shine”.